Skywatchers across parts of the United States and Canada have a chance tonight (Feb. 25) to spot NASA's space shuttle Discovery – on its last-ever mission – as it chases the International Space Station across the night sky. The International Space Station is can be easily seen on clear nights without a telescope because of its huge size and solar arrays. It is as long as a football field and has enough living space for astronauts as a Boeing 747 jumbo jet. On good passes, the space station is so bright it can rival the planet Venus in the sky and appears more than 25 times brighter than Sirius, the brightest star in the night sky. Discovery launched into space Thursday and is scheduled to dock at the space station on tomorrow (Feb. 26) at 2:16 p.m. EST (1919 GMT). So by Saturday evening, both will appear as a singular bright moving object. The International Space Station makes one full orbit around Earth about once every 91.5 minutes. Initially, after Thursday's launch from the Kennedy Space Center in Florida, Discovery trailed the space station across the sky by about 37 minutes. By tonight, that gap will have diminished to about 15 minutes. That means it will not be possible to see both space vehicles in the sky at the same time; rather Discovery would appear first, followed less than a half hour later by the space station traveling along basically the same path. Discovery is flying an 11-day mission to deliver a new storage room and humanoid robot to the International Space Station. This is the final flight of shuttle Discovery since NASA plans to retire the orbiter along with the rest of the shuttle fleet later this year. Discovery is NASA's most-flown shuttle and is making its 39th trip into space. So far as visibility is concerned, it appears that skywatchers living in the southern and central United States may be out of luck for seeing Discovery or the space station. This is because the trajectories of the spacecraft will send them on paths that are either too low or overhead during daylight hours, rendering them invisible. In the northern United States, there is a chance of spotting Discovery and the station on paths that will begin in the western sky then skim on a low arc in a direction toward the north and east. In most cases, the highest that either the shuttle or space station will get above the northern horizon, will be about 15 degrees. Your clenched fist held at arm's length measures approximately 10 degrees. So a 15 degree pass would be equal to about one and a half fists up from the horizon. From southern Canada, the two space vehicles will make an even higher arc across the sky. From Montreal and Calgary, for example, there are predicted passes that are more than 40 degrees above the horizon – nearly halfway from the horizon to the overhead point (called the zenith). Because of the International Space Station's massive size and configuration of highly reflective solar panels, it is the brightest man-made object currently in orbit around the Earth. Some have even caught a glimpse of the space station just prior to sunset or shortly after sunrise. And as a bonus, sunlight glinting directly off the solar panels can sometimes make the ISS appear to briefly flare to super-brilliance. The space shuttle also appears as a very bright (magnitude 0 to -1) object; almost matching Sirius, though nowhere near as dazzling as the ISS. 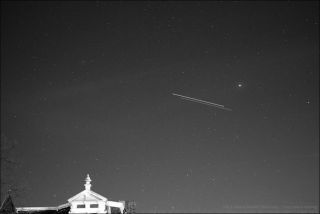 So what are the chances of spotting Discovery and the space station from your particular hometown? You can easily find out by searching for one of these four popular Web sites: Chris Peat's Heavens Above, Science@NASA's J-Pass, NASA's SkyWatch and Spaceweather.com. Each will ask for your zip code or city, and respond with a list of suggested spotting times. Predictions computed a few days ahead of time are usually accurate within a few minutes. However, they can change due to the slow decay of the space station's orbit and periodic reboosts to higher altitudes. Check the websites frequently for updates as viewing conditions can sometimes change due to mission developments.